It is obvious that such a statue leaves no one indifferent, if only to recognize the technical feat achieved in the nineteenth century. Impressive, she served on numerous occasions as a source of inspiration for artists who see different things depending on their sensibilities. Perhaps the best known artistic plagiarists is Salvador Dali, painter and Spanish sculptor of the mid-twentieth century. A native of Cadaqués, near the French border, at the edge of the Mediterranean, he used the nearby Perpignan station as a starting point for sending her works. Hence the expression "center of the world" to describe this station. The city of Perpignan has also honored him by renaming and the new TGV station. 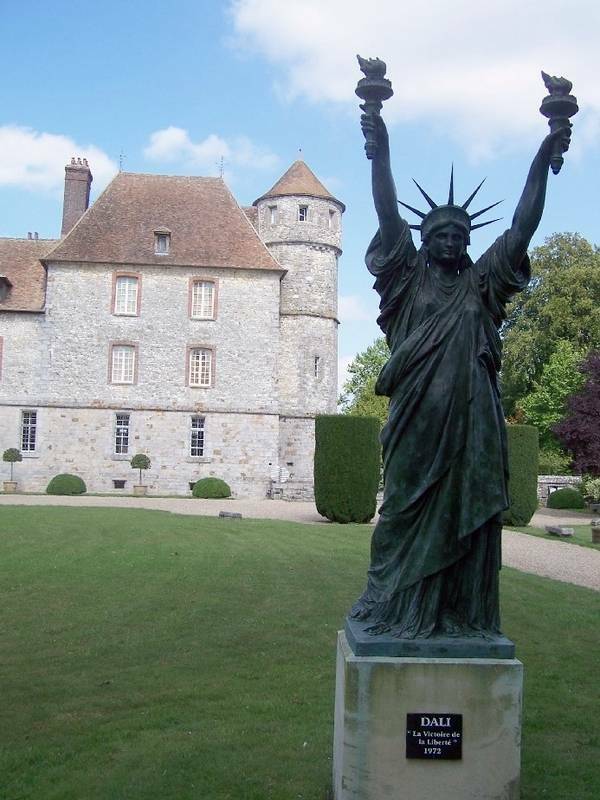 One of these works is just a copy of the Statue of Liberty with a certain originality: She raises both hands, each with its torch! Nowadays it is the castle of Vernoeuil and a copy is visible at the entrance to Cadaqués, her home town which hosts nowadays a museum dedicated to her work. Some are amateurs: One of the photos above shows what can cabinetmakers, or at least of those who preferred to work with wood. 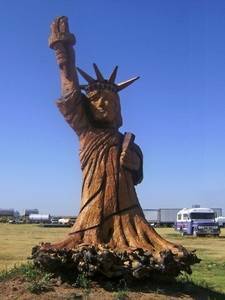 One made a statue with a chainsaw. The vertical trunk is the work of artist Gerard Ferruel, who carved in 1996 to mark the 10th anniversary of the feast of lumberjacks. It is Plaintel in Brittany (Côte d'Armor). The other trunk, carved into a tree stump, is the United States, its author is unknown. 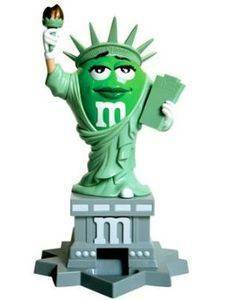 The next statue has a special history. It's made of cans. 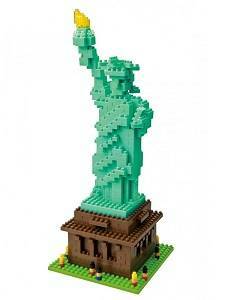 This is the first prize of a transatlantic including France and the United States contest contest organized to celebrate the 125th anniversary of the Statue of Liberty. 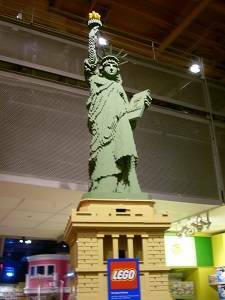 It was initiated by the cultural service of the Embassy of France in the United States and some American partners such as the US National Park Service, the Statue Of Liberty National Monument, the City of New York Parks and Recreations, etc. 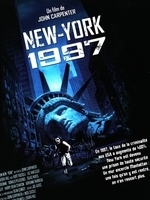 It was open to all French and American students, whatever their level of education, from kindergarten to the final year. It could be done in groups or individually. Statue of Liberty in cans. This is the first price of a transatlantic competition. The purpose of the competition was to make students aware of the benefits of ecology. 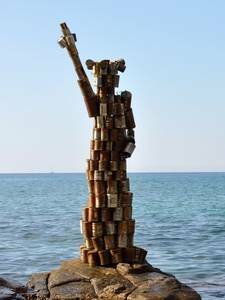 The theme was "The Statue of Liberty of the environment", the answers were sent in the form of an artistic work. 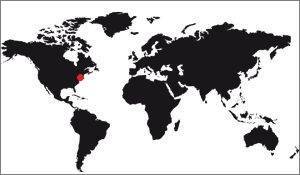 More than 4,000 students participated in the contest, on both sides of the Atlantic. 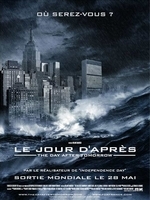 The winner was a French Academy of Besançon, Cécile Martin. 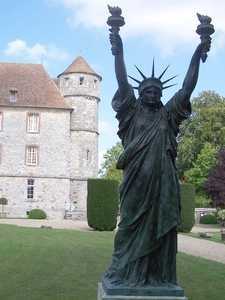 Listed third in Rouget de Lisle College of Lons-le-Saunier has made this statue in cans and wire that has been exposed among other in St-Cyr-sur-Mer, Var, next to a French replica well known (up Portalis) She won a round trip for two to New York. 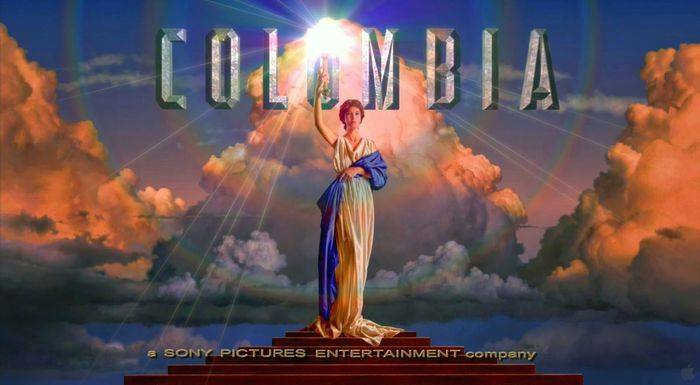 Columbia is a company of films productions, she has done, for example, the bridge over the River Kwai, or Close Encounters. Did you notice that the generic is a woman holding a torch? 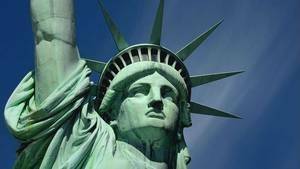 The analogy with the Statue of Liberty is obvious, although there was no mention of the chains of slavery, or of any tablet. More than the character himself is perhaps the environment that marks the similarity between the two works: The woman stands on a pedestal, and nothing in the field of view at the background comes disturb look, as if it were very high. 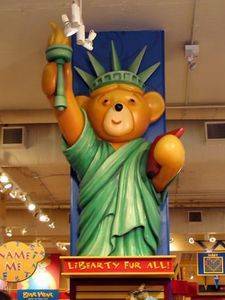 This is exactly what the designers wanted the statue of Liberty. We begin pursuing by fans of the saga "Star Wars" that had fun putting a face Darth Vader statue. 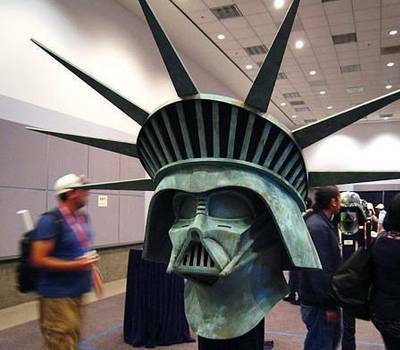 Unless this is the crown of the statue to Darth Vader. 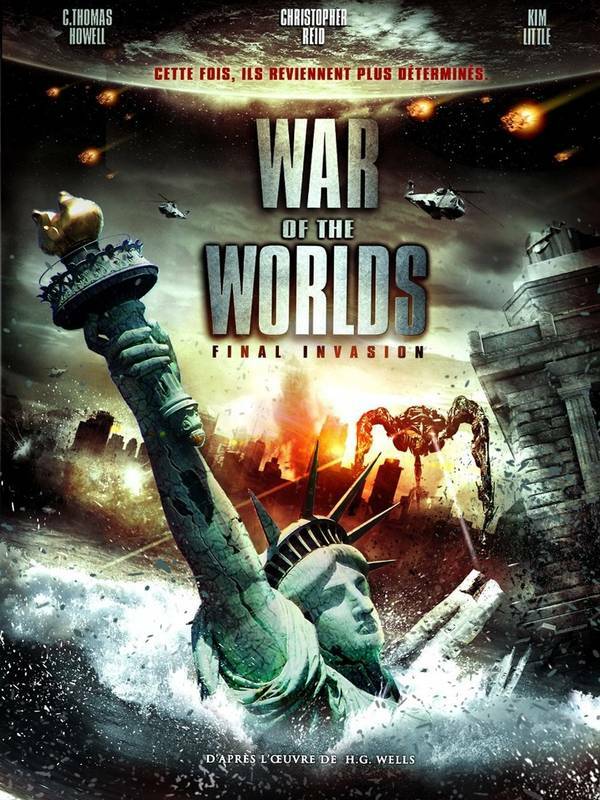 If all is well, the symbols collide violently. 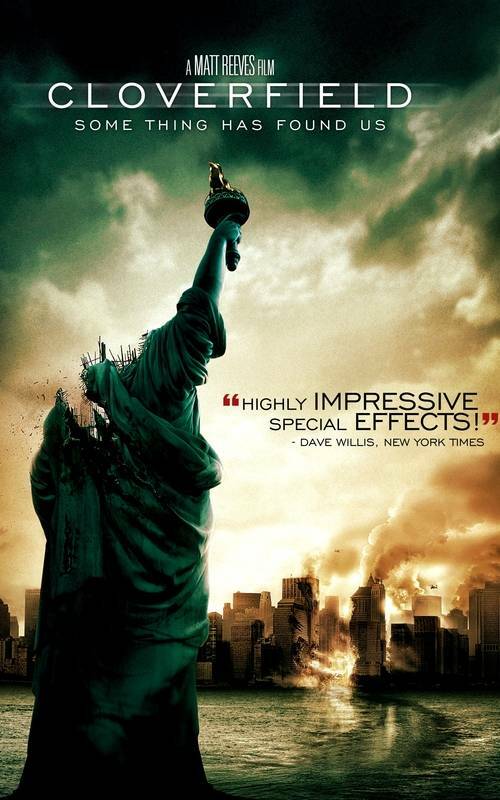 The symbol of liberty with the architect of evil in the galaxy, it does not go together. But we must recognize that the set is very well made, very original. 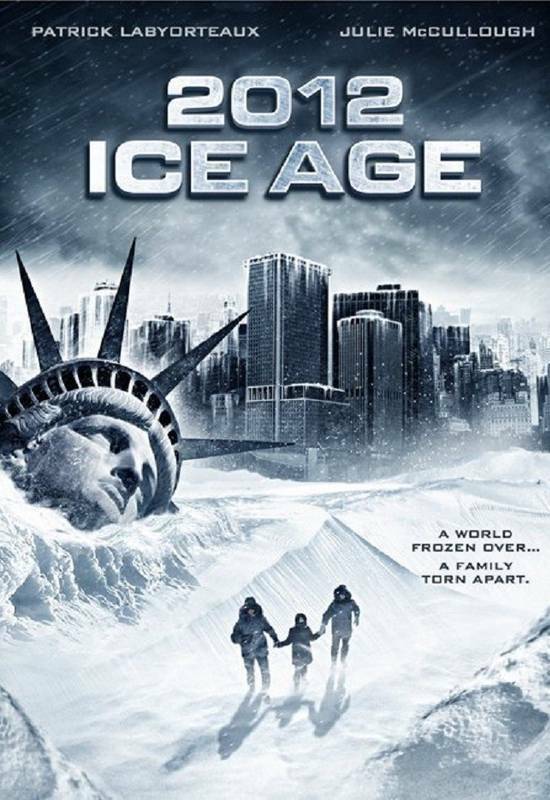 In the entertainment field we find a lot of reference to the Statue of Liberty. 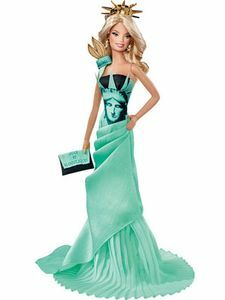 The creators of toys are given to heart-joy! 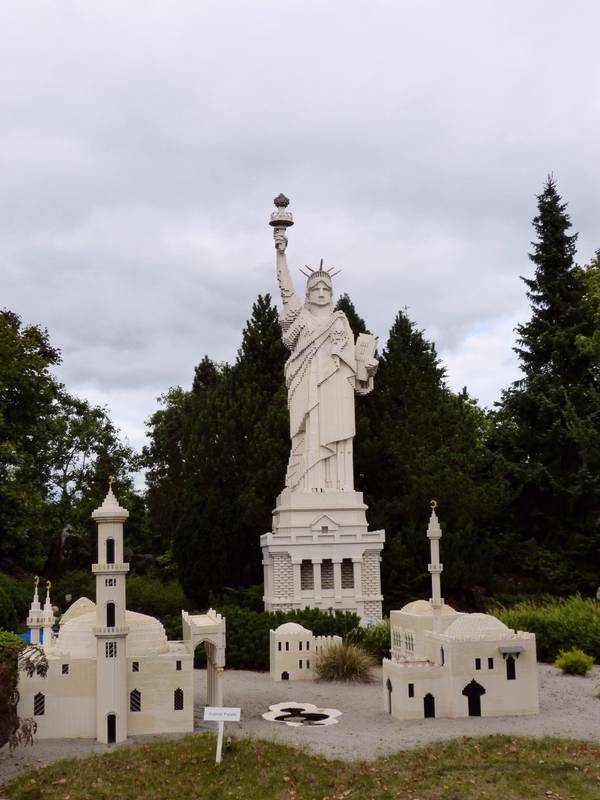 We find statues of Liberty Lego, Duplo in by Playmobil, and all sorts of other types of games. Below are some images showing what has been done at some point in the world of leisure. And beginning with Lego since seems to be the most popular game of the statue of imitators. Here are three, all different. They are followed by different toys: Duplo, the famous Barbie doll, and a statue of Minnie. 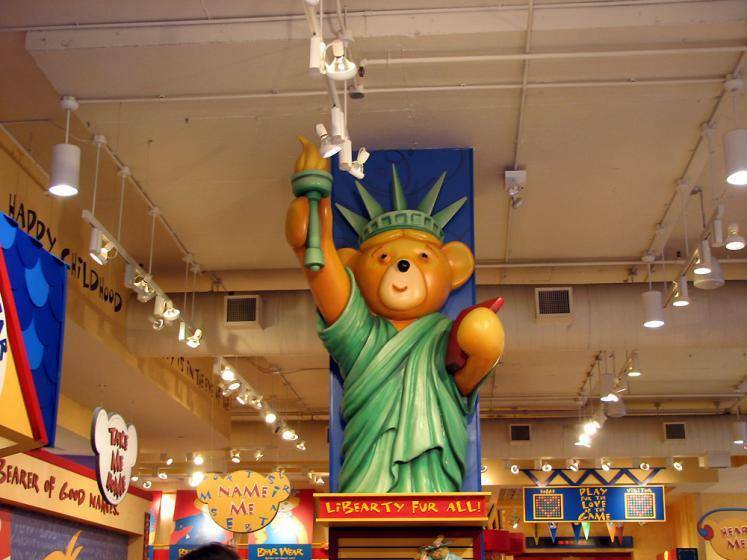 It is accompanied by a teddy bear, emblem of the store "Build-a-Bear-Store". 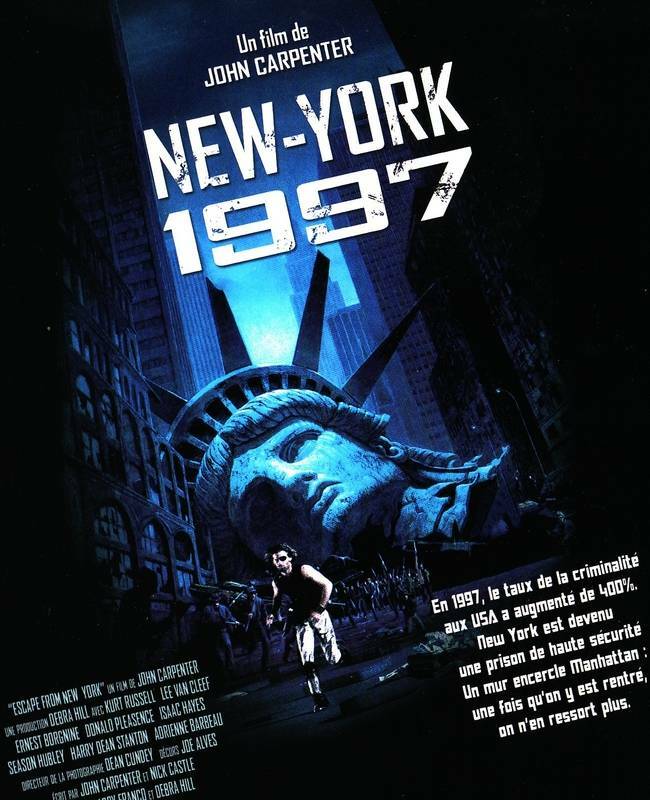 This photo was taken in 1996. 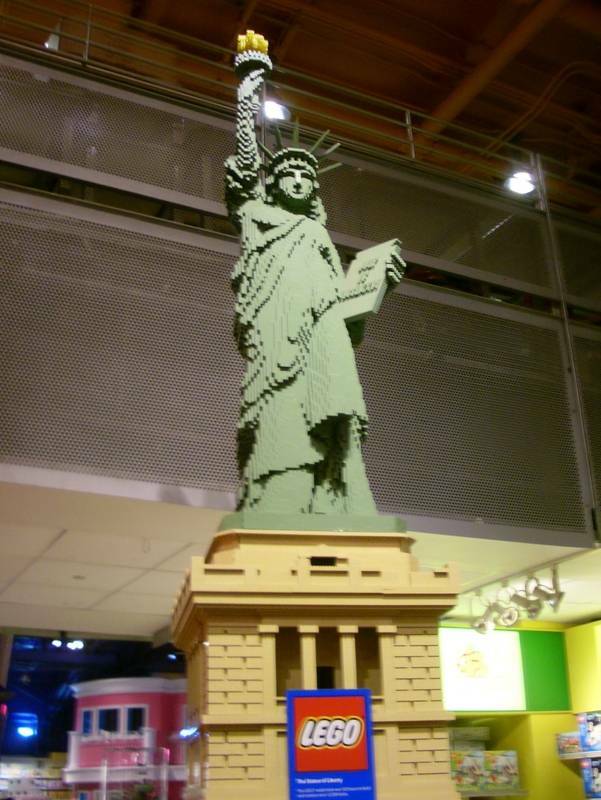 Statue of liberty in lego. 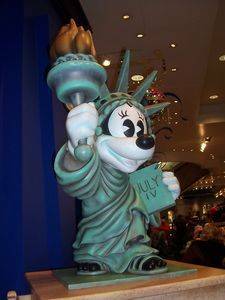 Minnie and the statue of Liberty. 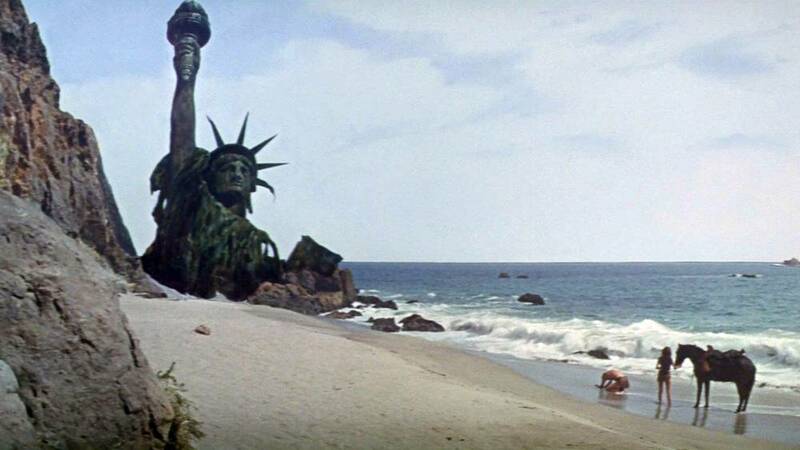 Now comes the statue in advertising. Obviously the Green Giant is the game, it seems so easy to distract. 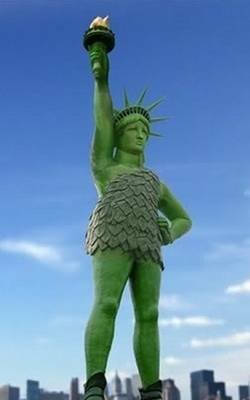 The Green Giant is a fictional character created by a canned vegetable brand launched in the US in 1903, the Minnesota Canning Company. In 1925 she created a character to praise the quality of vegetables, a savage dressed in toga sheet. Five years later it appears green, the color that he still has today. The savage was drawn very muscular, it is natural that it has become big and strong. 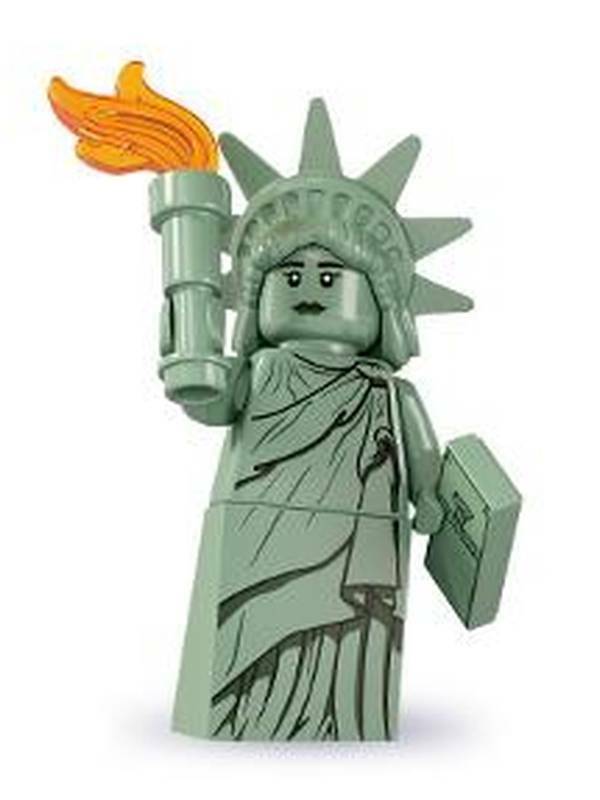 A giant character, all green, with a toga, it was enough to make him stretch a torch right arm. Small MM'S chocolate candies are well known in the world. 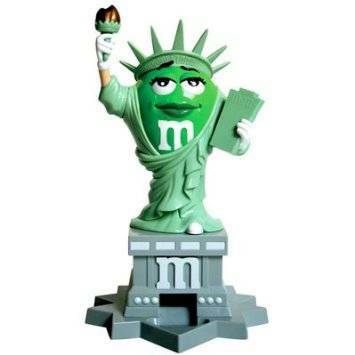 The brand makes much of the offbeat side of her favorite characters, two personified candy. 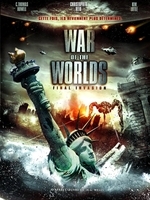 We just crossed them everywhere on Earth, they were staged in a lot of sightseeing, calling the imagination. 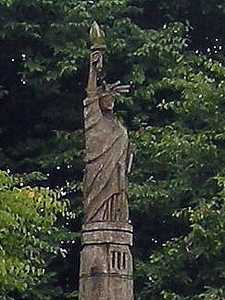 We had one day we find them as Statue of Liberty. 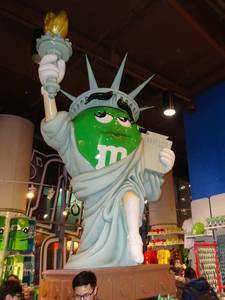 The left statue is in the store of the brand, in Times Square, New York. Perhaps you are not paying attention ... But if you know the Asterix albums by Goscinny and Uderzo, you must know the very recognizable design, it is in the album "The Great Adventure" . The two heroes cross the Atlantic and find themselves in an unknown land, which the reader immediately identifies with America. 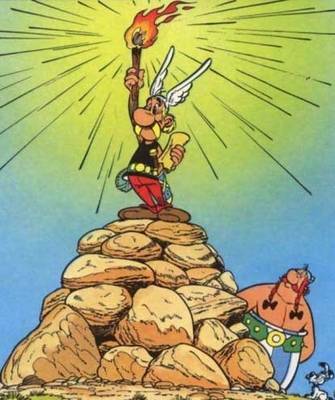 Before being noticed a boat along the coast while it is on the beach, Asterix stacked stones and brandishing a flaming torch. The posture does remind you of anything? Those who still doubt the voluntary similarity between the design and the Statue of Liberty must explain that this document is in the left hand of Asterix, a document that does not appear anywhere else. The idea of this design is very nice. 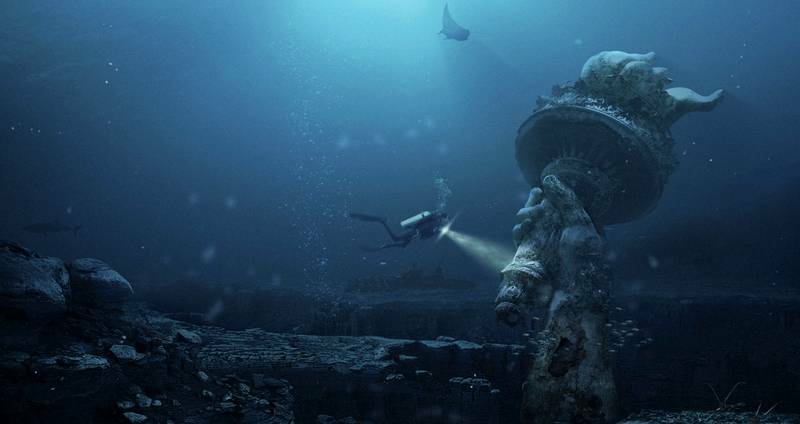 Follows a nice photo montage of the submerged statue. An example of what can happen when rising waters?